Unlock countless mysteries of the sewing universe! And the big question: would I recommend the Dreamstitcher 787 to a friend? An extra door makes threading so. much. easier. 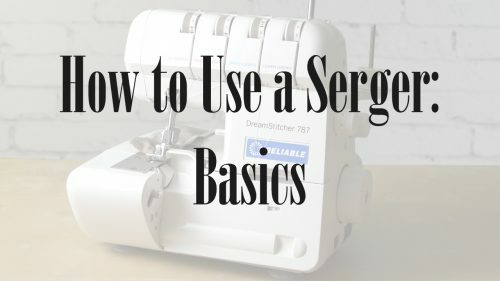 At about $300, it’s a teensy bit (about $50-100) more expensive than the most “economically-priced” sergers on the market. That being said, I think you’re probably getting more than $100 in extra quality with this machine. I’m not sure if it was a printing issue or not, but my manual was almost a little fuzzy/blurry. Normally this wouldn’t be a big deal, but when it comes to following a threading diagram, clarity helps a lot. There was a lot of squinting going on as I was threading and trying to follow the steps in the manual. Disclosure: I received a Dreamstitcher 787 from Reliable for review purposes. The opinions expressed in this video are my own. You rock. Just a top it’s much easier to thread your machine with a pair of good long tweezers. Also it’s also not good for your machine to be on a table that wobbles or your machine bounced it can ruin your machine. Keep on making videos I enjoy them. I’ve been sewing for 40 years and it’s refreshing to see people like you . Thanks again. I need to know how to put the cutter bar back up. I have a white 2000 ats.